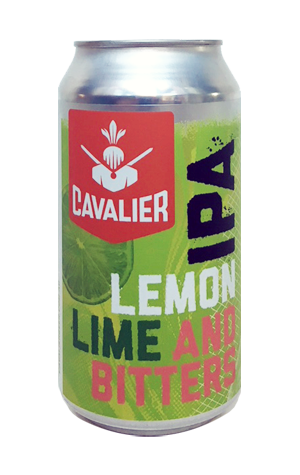 Cavalier Brewing has released its second one-off beer of autumn 2018, which also happens to be its second can release and the latest in its ongoing and occasional IPA series. And, while it occupies a spot on the beer sphere a fair distance from the brewery's first canned release – the Pineapple Mint Gose brewed with Bar Josephine – it is one that saw them return to the fruit bowl once more. Apparently, creating a lemon, lime and bitters IPA was on the agenda for some time, with the final piece of the jigsaw working out which type of bitters would take them to their happy place. And, after many trials, they ended up with good old Angostura. The bitters were the last addition to the beer, joining lemon and lime as well as suitably citrusy hop varieties Ahtanum, Mandarina Bavaria and Amarillo to create a beer that very much reminds one of the soft drink that inspired it. The brewers' favoured Gladfield specialty malts help create a copper colour (if not quite pink) and also keep any hop bitterness in check, making for a unique and easily quaffable 6.4 percenter.